In a large bowl, toss all ingredients until well incorporated... and dig in! Tempting colourful salad. Looks so delightful. This looks delicious Joelen! I will have to make this. I love big bowls of salad too. 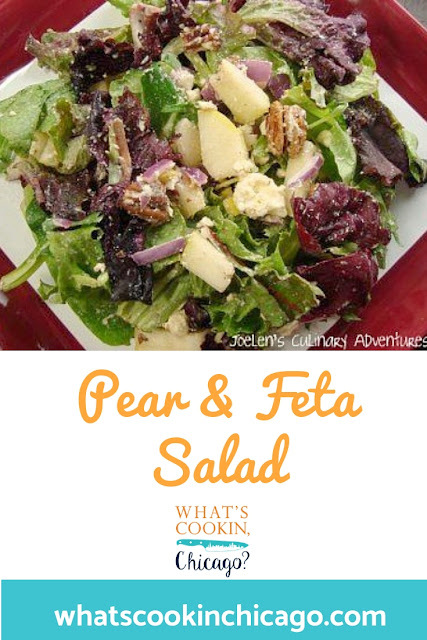 Pear in salad is one of my favorite combinations. You make the simplest but delicious dishes. I love this combination! BTW, the H will be out of town for 2 weeks and I'll have sole ownership of the TV clicker, heheh. A very elegant salad! I love it! What an interesting flavor combo of fruit and cheese on a salad. I bet I would love this! I love salads with lots of cheese and fruit too! My favorite is the Cosi Signature salad...so yummy! Great salad. Good texture combo as well as flavors. This sounds great! 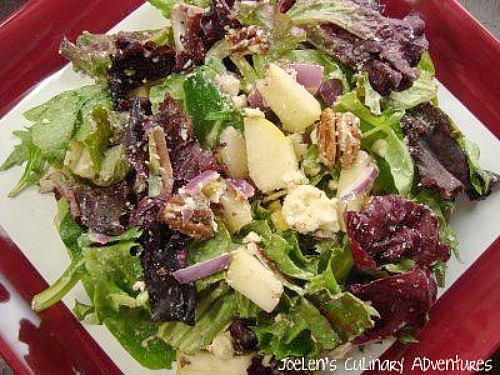 I love blue cheese/apple/walnut salads and this follows the same salty/sweet/crunchy formula. I have to try this for a change.